Its not like the trunk sticks out far or is the bg wide. Still, theres no reason. I guess she gets on the roof for a visor and on the hood for a windshield?? 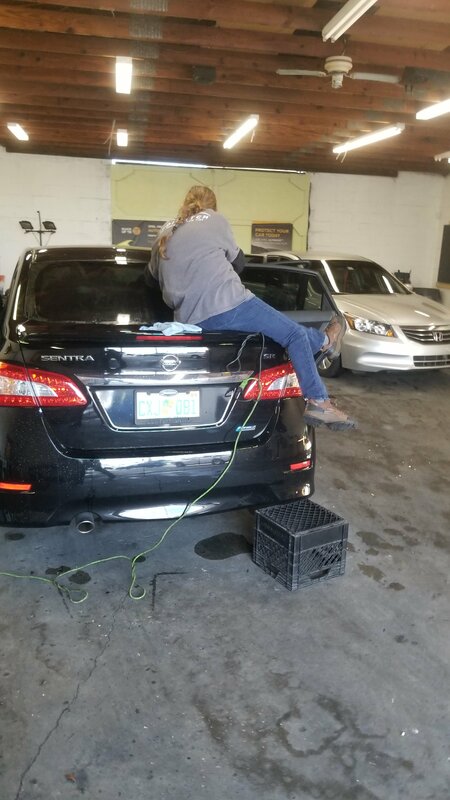 I see a bunch of knots in extension cord and the heat gun cord...guess you might as well prop up a crate and sit on the trunk. that's a never scratched a glass always flawless Tinter right there for ya. High Volume doesn't equal quality...the highest volume shop I know in GA is a trash shop with horrible ratings. They just cheap with a good location. Wow. I make it a point never to place anything (tools, boxes, etc.) on the paint except towels. I see guys place their spray bottles on top of cars paint all the time and it makes me cringe. I see the issue here! using that crate instead of a OSHA proved ladder to hop up on that trunk! makes us Florida tinters look bad !